Desi Smith/Staff Photo. 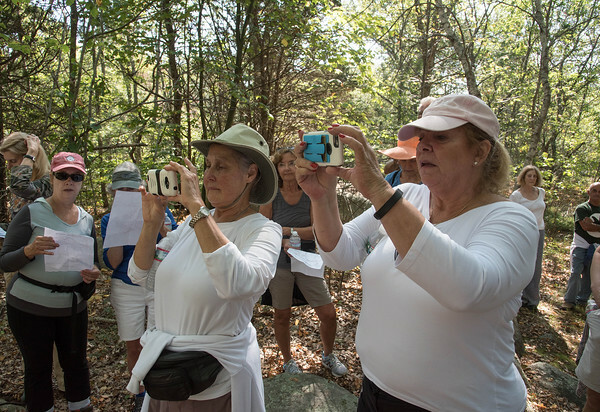 Eleanor Withe (left) of Newbury and Ellen Downey of Gloucester take some photos during the Babson Boulders Tour in Dogtown Saturday morning. A group of 25 people lead by Tom Dexter, the Commissioner of Essex Heritage. Another walk is scheduled for Sept 26, 10 a.m. to noon at the Dogtown Common entrance on Cherry Street. Participants should be prepared to walk on rough trails for 2 to 3 miles.